SOCU investigators at the Guyana Rice Development Board. 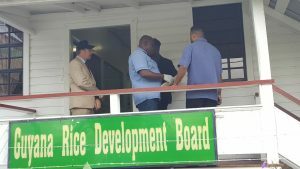 Agents of the Guyana Police Force’s Special Organised Crime Unit (SOCU) on Friday searched the Guyana Rice Development Board’s offices for evidence in relation to the findings of a forensic audit. “It’s important to take action quickly to gather the documentation that is needed for evidence in cases of money laundering, tax evasion, theft so that’s exactly what we are doing,” said UK Advisor to SOCU, Dr. Sam Sittlington. After gathering the evidence, he said the next step would be the prepare the case report. Asked whether perpetrators of financial crimes might have gotten rid of evidence ahead of SOCU’s search, Sittlington said investigators would be able to track down the required information. “There is an audit trail for everything and there may be documents missing but you still have an audit trail in terms of financial transactions and there should be projects ongoing,” he said. Investigators hope to tap into information from external and internal auditors associated with a number of projects. When asked whether anyone has been charged in relation to alleged financial crimes at GRDB, Head of SOCU, Assistant Commissioner Sydney James said investigations have recently commenced. “We are conducting a search to unearth further evidence in addition to what has been discovered by the forensic auditors,” he said, while declining to say whether anything was found Friday morning. The forensic audit conducted by Nigel Hinds and Associates in June, 2015 finds that GYD$100M was allegedly loaned to General Secretary Dharamkumar Seeraj Rice Producers’ to pay rice farmers who had supplied paddy but were still unpaid by the previous People’s Progressive Party Civic (PPPC) administration. The audit also found that more than US$500 million from rice sales through the PetroCaribe arrangement with Venezuela had been in GRDB’s possession. Allegations are that some of those funds had been used to trade in foreign currency slightly above the market rate.